Playing the VICTORY THEATER CENTER in Burbank EXTENDED through MAY 4, 2014. 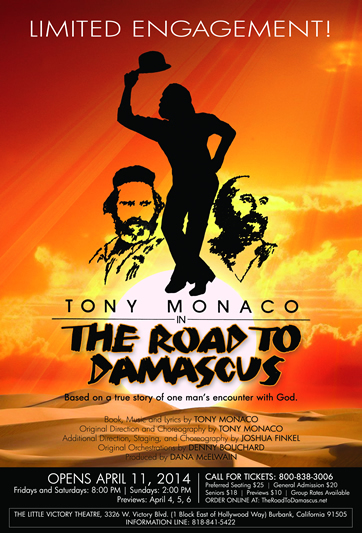 Tony Monaco stars in THE ROAD TO DAMASCUS, a solo show currently performing at The Little Victory Theater in Burbank that takes inspiration to a person that is written within the scriptures. The program opens with a performance of song and dance man George Spelvin on a theater stage whose career is falling apart due to his excessive drinking. From that point, the scene shifts some centuries before to where Saul speaks. Saul, who was also known as Paul (later Saint Paul) was an apostle who became a prophet of the teachings of Christ in the early period. Although he appears to be as two separate people, Saul/Paul is actually the same being. He speaks about what was taking place within the Roman era world, and as Paul, makes his commentary about becoming a teacher and follower of Christ, the prophet of Christianity which was spreading over the world. . This show is a single showcase of Tony Monaco, as he composed the book, music and lyrics to this work. Monaco’s take of Saul/Paul is what brings this theater piece to its height. yet he brings his characters to life each fervently believing what is being vocalized. He doesn’t necessarily preach per se, but he shows that, along with the many other followers that will come and go through time and tide, he knows there are so many who want to discover what’s right, proper, and true. As to the technical aspects of things, Richard Zemaitis’ set design is rather simple. A stone wall facade is seen within its backdrop, along with visual depictions of the illustrated settings within the times of Saul/Paul as designed by Ian McBryde, projected onto a screen positioned stage right. and Joshua Finkel is at helm with the choreography, staging, and additional direction, based on the original direction and choreography by the performer. Mr. Monaco’s previous career stretches back many years. Performing under the name of Tommy Morton, he has appeared in a number of shows on Broadway (Make Mine Manhattan, High Button Shoes, Pal Joey, among others) as well as a few big screen musicals. (Main Street to Broadway for MGM, The Stars Are Singing for Paramount, etc.) This show is more personal to Mr. Monaco as it was based upon what he experienced many years before as a singer and stage dancer that was falling down but never out. Even though this show holds a lot of spiritual inspirations, it’s not preachy and defiantly not religious, but it’s not a slice of fast paced show biz antics, either! It’s just a humble trip down the title road where one can become inspired to possibly follow. THE ROAD TO DAMASCUS, performs at the Little Victory Theater, 3326 W. Victory Blvd., (one block east of Hollywood Way), Burbank. Showtimes are Friday and Saturday nights at 8:00 PM, and Sunday matinee at 2:00 PM. For tickets, call (800) 838-3006, or order online at http://www.TheRoadtoDamascus.net.